EU Special Representative Bernardino Leon does not believe that the military’s crackdown can create long-term stability in Egypt. The long-awaited official review of the EEAS is smart, realistic, and ambitious. It is now up to the member states and institutions to drive EU foreign policy forward. Judy Asks: After the Egyptian Coup, a Civil War? Every week leading experts answer a new question from Judy Dempsey on the foreign and security policy challenges shaping Europe’s role in the world. Selling Europe’s Human Rights: Loud and Clear or Softly-Softly? Europe’s politicians are split on how to address human rights issues. Those in favor of quiet diplomacy should make sure their words aren’t too softly spoken. As Europe’s political observers pack their suitcases, they should spare a thought for a few foreign policy concerns that will be just as pressing in the fall as they are now. European governments have settled into a long-term attitude of irresponsibility for the stability of their continent. Europe’s leaders need to break out of their lethargy. A year and a half after NATO’s intervention in Libya, the security situation is miserable. In its own interest, Europe needs to help address this problem. Countdown to a Coup d’Etat in Egypt? 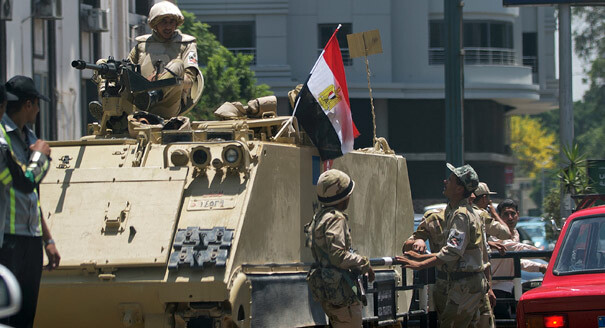 As the Egyptian economy continues to deteriorate and public dissatisfaction with President Morsi grows, rumors are spreading that the military is preparing a coup d’état. A German lawmaker explains why her country is so hesitant to participate in the Mali missions. Conferences like the MSC have become far too big and unwieldy to take away a clear message. But they are still useful. Europeans need to take more responsibility for their immediate neighborhood, as they can no longer expect the United States to lead the military front for them. It requires a special courage and leadership to address the wrongs of the past and deal with those who want to ignore the it. But without such reflection, the future is marred. Stability in Mali needs the support of Algeria, which has become an increasingly more important regional player. Europe and the United States were still busy praising Morsi for the cease fire that he brokered so successfully in Gaza when he, suddenly and quietly, made a grab for nearly dictatorial powers in his country. Judy Asks: How Can Europe Help Morsi End the Gaza Crisis? Every week leading experts answer a new question from Judy Dempsey on the international challenges shaping Europe's role in the world. Europeans should offer fast, strong, and visible support to civil society activists in Arab countries in democratic transition. Is Germany Getting Tough on Russia? If Germany changes its attitude now, the EU might finally find itself in a position where it could adopt a coherent and value-oriented strategy on Russia. Germany is still not willing to address two issues that are crucial to formulating a foreign policy strategy either at the national or at the European level. Libya: Europe’s Soft Underbelly or a Potential Source of Strength? Until economic and security issues are addressed, neither Libya and its North African partners, nor the EU will manage to find common ground necessary for broader cooperation. Libya would win the praise of the international community if it offered both apology and compensation to the six formerly imprisoned Bulgarian medics charged with conspiring to infect children with HIV.